Woodlawn Cemetery was founded in 1837 with the purchase of 1.25 acres adjacent to the Stayton Family Cemetery for the "interment of all Jackson County residents". In 1845 Joseph and Sally Hansbrough sold one and 6/25 acres of land for use as a grave yard for persons of Jackson County. The land was to be used for the purpose of public burials. This established the cemetery known for many years as the City Cemetery. The land south of the original cemetery was sold to Father Donnelly in 1853 adding six acres on the southern edge calling it Saint Mary Cemetery for the use of Catholic patrons. 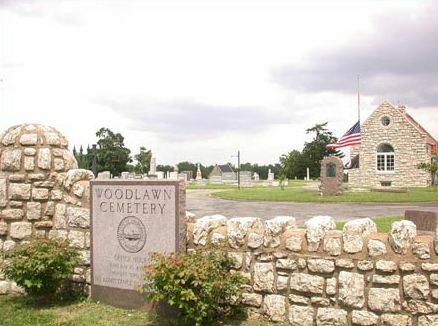 These three cemeteries were combined in 1922 to become Woodlawn Cemetery. The Woodland Cemetery now contains 56 acres, the final resting place for over 33,000 graves. Within its walls is the history of the Civil War and the Sante Fe Trail. Civil War Confederate Army Officer. He served during the Civil War as Colonel and commander of the 12th Missouri (CSA) Cavalry regiment. He was killed at the first battle of Independence, Missouri. Plot: Buried next to Brigadier General John Taylor Hughes. Colonel James Chiles was a Senator for the state of Missouri. Great uncle to Harry S. Truman, father of James Crow. Civil War Confederate Brigadier General. Prior to the Civil War, he was a Colonel of militia and a Missouri State Representative. At the start of the war, he was elected Colonel of the Missouri Guard 1st Regiment and participated in the Battle of Carthage, Wilson's Creek and was wounded in the Siege of Lexington. In the summer of 1862, he returned to Missouri to recruit for the Confederacy and was appointed as either an acting Confederate or Missouri State Guard Brigadier General. He was with the James Gang (Jessie and Frank James) after the war. He was a secret foe of the James and testified against Frank James at his trial. He was involved in several James Gang train robberies. Graduated Dartmouth College in 1833; admitted to the Bar in Amherst, NH in 1836; moved to Lexington, MO in 1838; elected circuit attorney of the sixth judicial circuit of Missouri in 1848; reelected in 1882; delegate to the MO Constitutional Convention in 1861; delegate to the Democratic National Convention in 1868; elected judge of the 24th Judicial Circuit and served from 1871 until 1876 when he resigned; elected as independent Democrat to the forty-sixth congress in 1881. Author of "The Fourth King" which contained poetry, some of which first appeared in The Saturday Review, presented as a biography of Adam and man searching for truth and survival. also known as Samuel H. Woodson - Delegate to Missouri state constitutional convention 25th District, 1845-46; member of Missouri state legislature; U.S. Representative from Missouri 5th District, 1857-61. Democrat. U.S. Representative from Missouri 8th District, 1879-81. Granduncle of Harry S. Truman. Member of Missouri State Senate. Member of Missouri state house of representatives, 1854; colonel in the Confederate Army during the Civil War. While leading his troops, was killed in battle at Independence, Jackson County, Mo., August 11, 1862. A slave that purchased his freedom for $1,500. He became famous as a wagon builder during the early trail days and westward expansion. He turned his carpentry skills into a successful business of building oxen bows and manufactured wagons. He purchased many slaves from the slave auction block and used them as laborers. He paid them approximately $5 a week and did not treat them as slaves thereby allowing them to work out their own freedom. Ordained one of the original twelve Latter Day Saints (Mormon) Apostles. Local entrepreneur and U.S. mail contractor, owner of the Vaile Mansion, which had flushing toilets, a 48,000 gallon wine cellar, and a built-in 6000 gallon water tank, all of which were very uncommon when the mansion was built in 1881. The house, designed by Kansas City architect Asa B. Cross, at a cost of $100,000. An 1882 article in The Kansas City Times says that it is "the most princely house and the most comfortable home in the entire west." The 30-room mansion's design was inspired by a large house in Normandy the Vailes had visited during a trip to Europe. The City of Independence manages and maintains the entire cemetery, providing perpetual care to all burial sites. Burial lots are available. For information on Woodlawn Cemetery call (816) 325-7365.